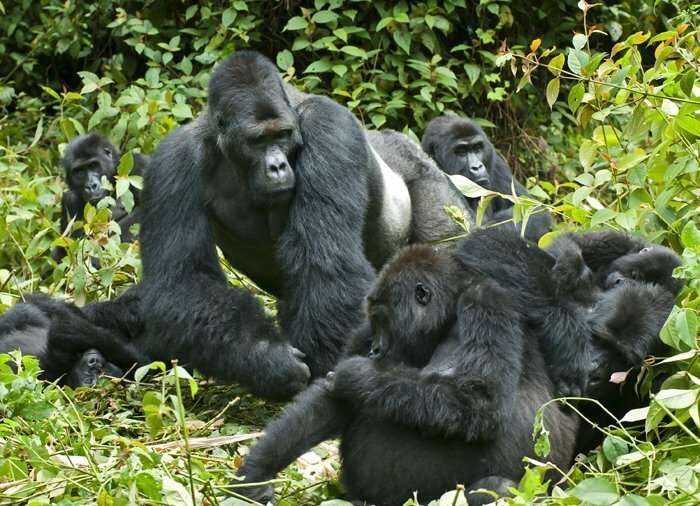 The 3 Day Uganda Gorilla Trekking Tour is a magical journey into the isolated jungles of East Africa, promising you an expereince like no other. Sitting among a family of wild mountain gorillas in the deep misty jungle of Uganda’s Bwindi Impenetrable Forest is utterly magical; nothing can ever prepare you for such an experience – their sheer beauty, brawn and soulful brown eyes, their astonishingly human-like expressions or their extraordinarily gentle demeanour. One hour with these gentle creatures – 60 minutes, is all it takes to change your whole life’s experience. 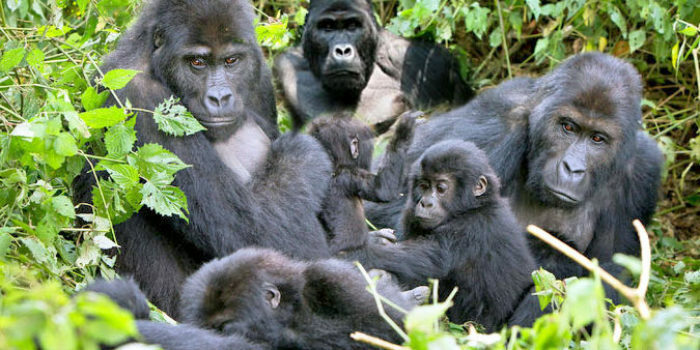 This Uganda Gorilla Trekking Tour is a budget safari that is designed to allow every traveller have a chance at spending time with the endangered mountain gorillas. If you’re a luxury traveller, don’t bounce off yet, this Uganda Gorilla Trekking Tour can be tailor made to suite your style too. Enquire with our team of experts to makes sure they get everything right – including accommodation, transportation, meals and the gorilla permits. Note: Depending on availability of gorilla permits at the time of confirmation, you may trek gorillas in Buhoma, Ruhija, Rushaga or Nkuringo. 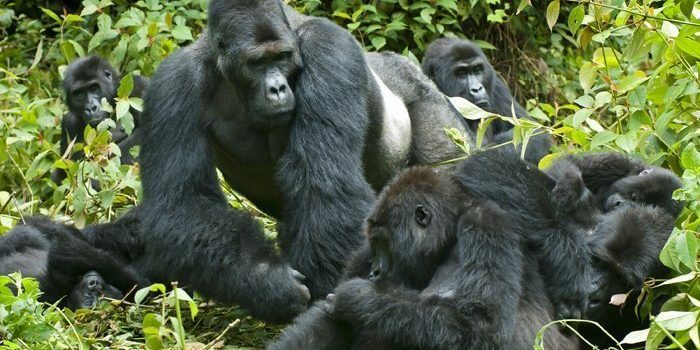 Depart Entebbe\Kampala for your first day of Uganda Gorilla Trekking Tour; An 8-9 road transfer to Bwindi Impenetrable Forest National Park located in South western Uganda. Quite a long drive but worth it because you get to enjoy the countryside scenery, some of the most beautiful nature’s images all the way to the Virunga massive. Keep your cameras near you and our driver will definitely stop if you need him to so that you cam capture that beautiful moment. You will have an en route stopover at the Equator crossing for photographic and simple experiment before continuing to Mbarara town for Lunch. After lunch, you will embark on your scenic drive to Bwindi NP or Kabale for overnight at Rushaga Gorilla Havens Lodge or Trekkers Tavern Lodge. Accommodation: Rushaga Gorilla Havens Lodge or Trekkers Tavern Lodge. 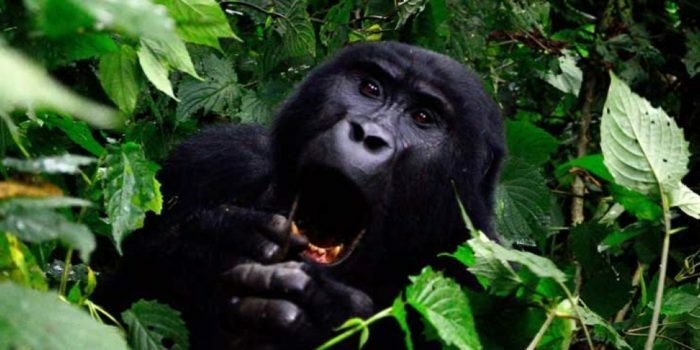 After an early morning breakfast, you will drive to the Park headquarters for registration and joining others for a gorilla trekking briefing about the dos and the don’ts during your Uganda Gorilla Trekking Tour. Once this is done, you will trek through thick creepers and undergrowth with your guides to find the Gorillas, which can take you from half an hour to three quarters of the day. The steeply forested landscape is incredibly dense but crisscrossed by numerous animal trails allowing access to tourists. On your trek, you are likely to spot other primates, birds and rare tree species. After finding the gorillas, you will be allowed to spend one hour with them before trekking back to the Park headquarter. This is indeed an extraordinary feeling being with these beautiful yet endangered Creatures. You will be awarded a certificate for participating in gorilla trekking and thus contributing to the conservation of mountain gorillas. Overnight at Rushaga Gorilla Havens Lodge or Trekkers Tavern Lodge. After your breakfast, you will be driven to Kampala or Entebbe for your post tour accommodation or you may choose to fly out of Uganda today. You will use the same Uganda Gorilla Trekking Tour route as when you came, enabling you to enjoy that countryside air one more time. 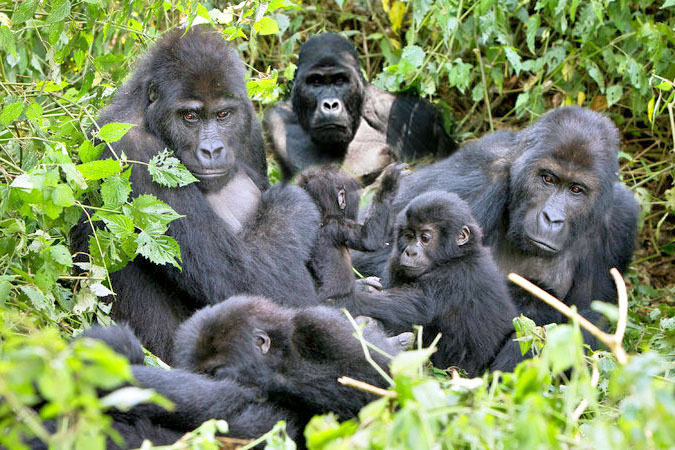 We can organise the Uganda Gorilla Trekking Tour via Kigali, the shortest route, so you need some Rwanda information too. 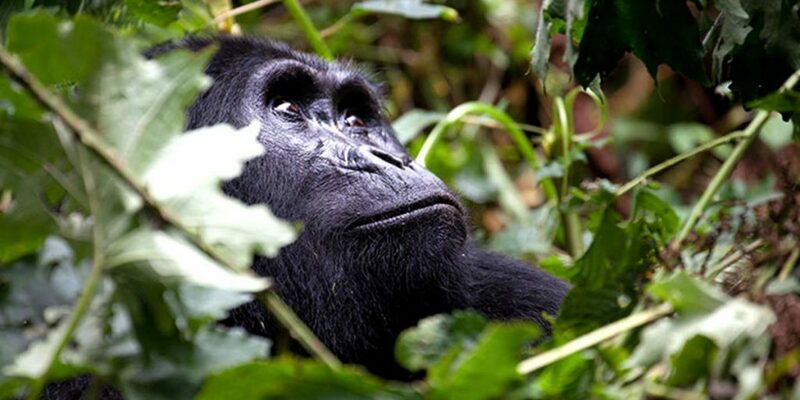 Of course you also need a visa to get into Uganda or Rwanda as part of the Uganda Gorilla Trekking Tour trip. Uganda – Most nationalities require entry visas when travelling to Uganda. Visas can be purchased on arrival at the airport for USD 50, or can be issued by Ugandan High Commissions in countries where they are represented or applied for online in the comfort of your sits (this part may be strenuous though) . The fees for visas issued at Ugandan high commissions abroad are generally more. USD notes have to be dated 2006 or newer and be in good condition with no tears or marks. The Uganda Gorilla Trekking Tour vehicles you will be traveling in are customized 4×4 vehicles which have been converted for local conditions – they have good leg room and seat between 4-7 persons, depending on the seating configuration, and have opening roof hatches for optimal game viewing. They are a little slower on the road than a saloon vehicle or a smaller ‘family’ 4×4 and do have air conditioning. Your safari vehicle is generally used through out the safari for travelling between destinations as well as for game drives and other activities at the lodges and within the National Parks. Depending on the class or style of your Uganda Gorilla Trekking Tour, your accommodation may range from luxurious to moderate or budget. There are many different styles of accommodation in Uganda/Rwanda varying from large hotels to smaller more intimate lodges and tented camps. Please consult your personalized itinerary for full details of each place you will be staying on your safari. Due to space limitations in the vehicles it is imperative that luggage be kept to a minimum. We suggest a barrel or soft bag (15 kg maximum) for your main gear, plus a camera bag or smaller ‘day pack ‘ for inside the vehicle. Samsonite / hard bags / suitcases, etc. are not suitable as it makes packing very difficult. If you are travelling internationally with one we suggest you repack Uganda Gorilla Trekking Tour items into your soft bag, before the safari, and then leave your hard suitcase at your return point eg Entebbe Hotel to collect later.